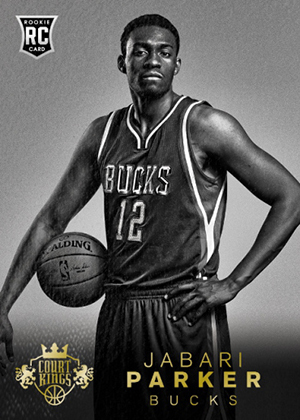 2014-15 Panini Court Kings isn't your average-looking set of cards. As far as designs go, it's out there. If it were 1994, the word "extreme" might come to mind. For some, that might be a turn off. Others might welcome the change of pace. 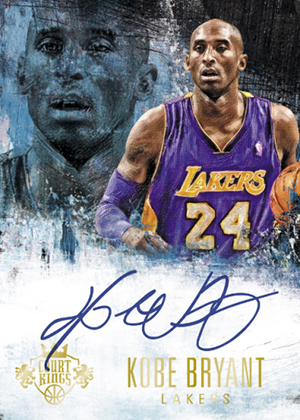 Boxes are a ten-card affair with each promising an autograph and a memorabilia card. 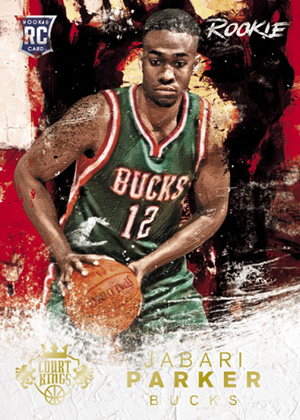 Each of the 33 first-year players in the set has five different base card designs. Available in different rarities numbering as low as 10, all five cards come with distinct designs. They range from black and white portraits to graffiti-ladden backdrops to cards that are just colorful. Each box has one rookie card. Rookies are also featured in multiple autograph and memorabilia sets. 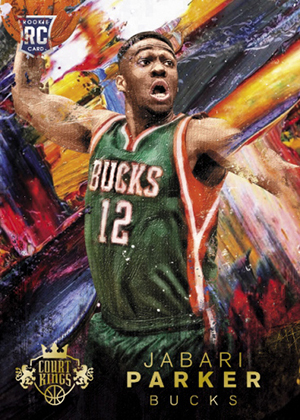 Heir Apparent (#/130) features on-card signatures and a limited checklist of 12 players. 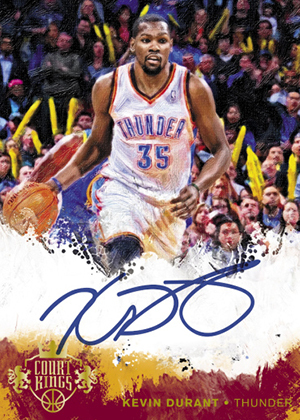 Fresh Paint also has on-card rookie autographs. Art Nouveau has different levels of player-worn rookie gear including Numbers (#/25), Patches (#/10) and Nameplates, which have full letters from the back of a jersey. The hits aren't only about rookies though. 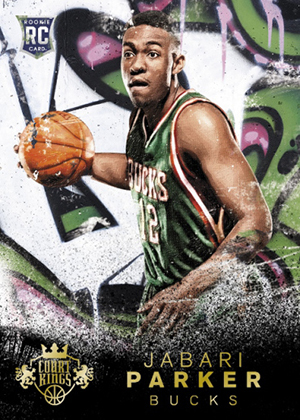 Court Kings Autographs bring on-card signatures from known names. 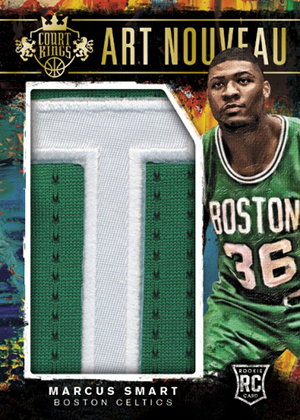 On the memorabilia side, there are Performance Art Jerseys and 2-on-2 Quad Memorabilia cards that have both regular versions and premium swatch parallels. Collectors can find over-sized Box Toppers, some of which are autographed. 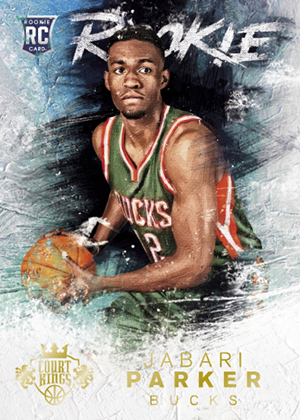 2014-15 Panini Court Kings Basketball boxes have a pair of inserts. Among them are Le Cinque Piu Belle, which are numbered to the player's jersey number, and Also Known As (#/49). Hot boxes with bonus hits are randomly inserted. 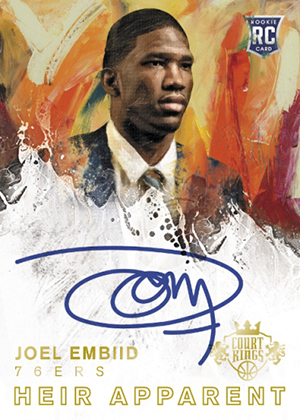 2014-15 Panini Court Kings Remarkable Rookies Joel Embiid # 499! 76ers!! 33 cards. Serial numbered #/225. 33 cards. Serial numbered #/10. 100 cards. Serial numbered #/149. Court Kings design are usually elegant that provide colorful way of showcasing basketball. Card wise they look nice and fan to collect. For streamline collectors, these products usually standouts from the rest of the collection. Court King autographs usually provide a good collection and hopefully the same way for this batch. 2014 Rookies are deep and having autos that are different from standards ones make them desirable here. Good: Focus group signatures. 10 cards per pack means less unusable cards. Design is nice and colorful. Bad: Hard to get the good cards relative to the few card collation. Overall: Real Collectors would buy cases of this one. Casual Collectors might try one or two boxes. Streamline collectors would collect their PC in conjunction with this set. I have only opened one box of the hobby so far and my experience was awesome. I would have to say I ended up with a better than average box based on what you are promised per box. My box topper was an Autographed Bill Walton 5×7. In the pack, I pulled a 2on2 Nowitzki/Ellis/Hardin/Howard #/25 and each patch is two color. Also pulled a Marquis Johnson auto #/149 and 4 rookie cards including Wiggins #/149. I know that’s not a typical box so my review is a little inflated one way, but how can I say anything bad even if the next box I open ends up mediocre? You can see this box opened on video on my YouTube channel. Link to YouTube through Facebook.